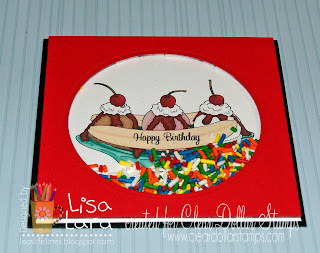 Good Tuesday Tutorial morning to you...this is Lisa. Its my turn to make a little inspiring (I hope) tutorial for you. My Marine son has been home visiting before he deploys to Afghanistan next month. Such a blessing. Now onto our tutorial. 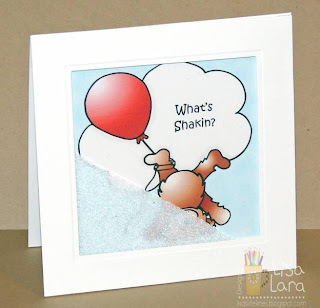 Today I will show you how easy it is to make a shaker card using Color Digital Images. 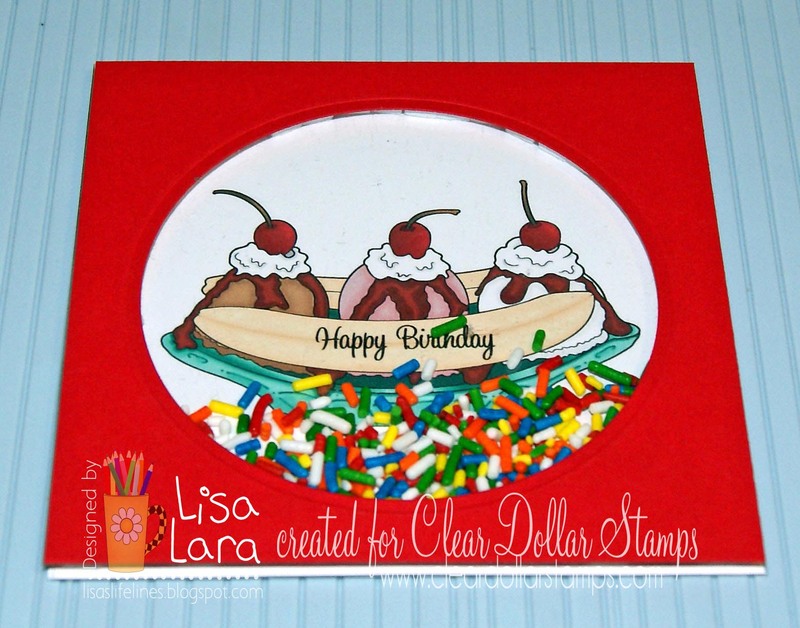 Here is the Color Digi Shaker Card we are making today. First we'll start with the inside of our card. My black card base is 5 x 5, fold at the top, from a piece of 5 x 10" cardstock. 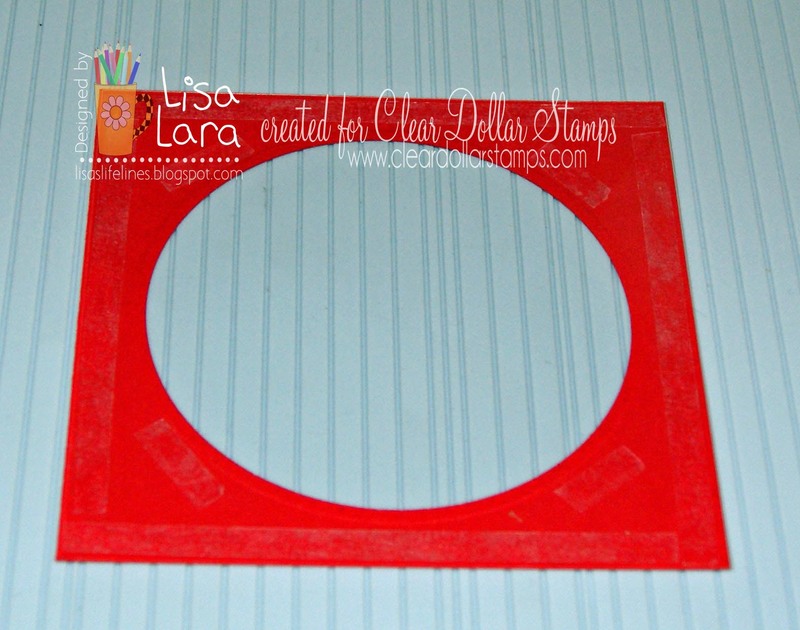 The inside white cardstock piece is 4 3/4 x 4 3/4". 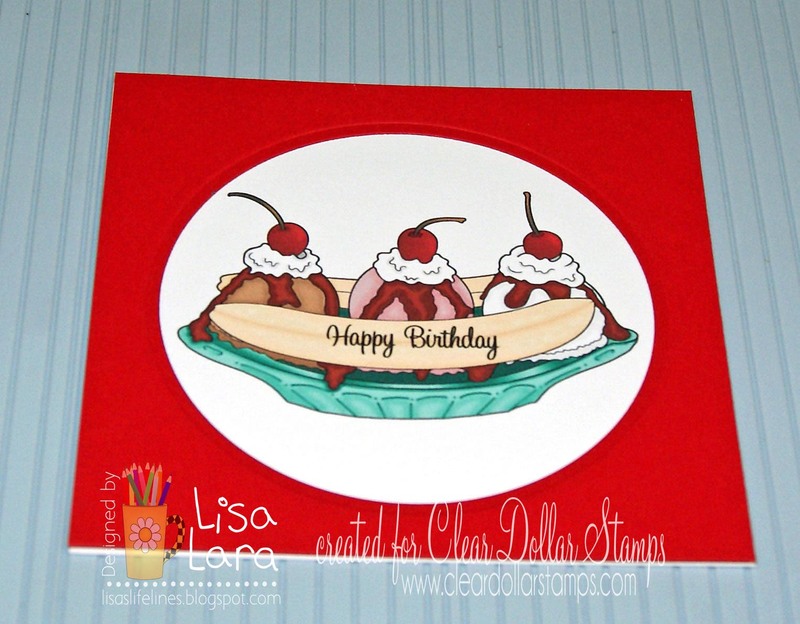 In Publisher I placed my png banana split outline image from ICE CREAM SOCIAL COLOR DIGI and then washed it out to make a faint image so you can still write over the top of it. 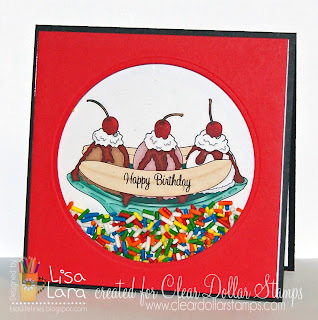 Then I placed the png sentiment from BIRTHDAY CELEBRATION DIGI and recolored it red. 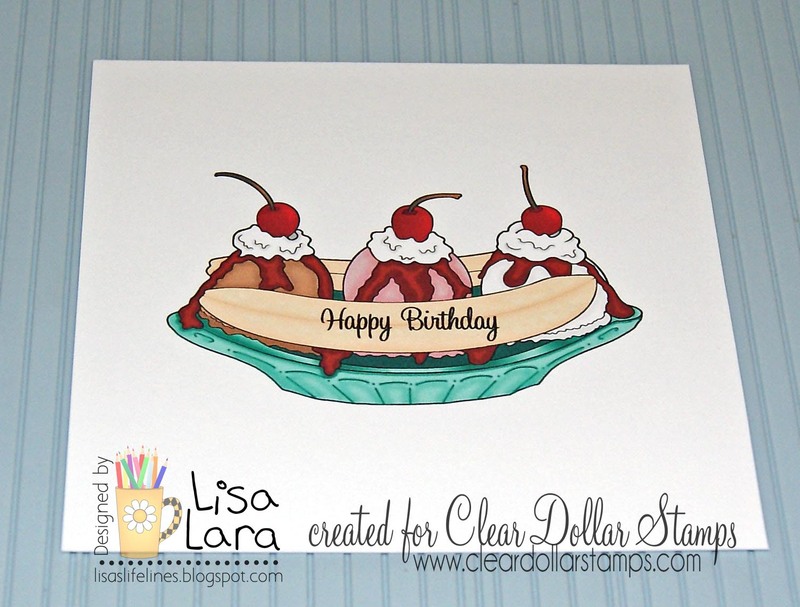 You can learn how to RECOLOR digital images in the past HOW TO RECOLOR YOUR DIGIS WITH DIANE tutorial. Here is our front panel. The png colored banana split image is printed onto white cardstock cut to 4 3/4 x 4 3/4". In Publisher I placed the png Happy Birthday sentiment also from the ICE CREAM SOCIAL COLOR DIGI directly onto my image. The png image is transparent so you can place on top of another image. This is front panel 4 3/4 x 4 3/4" that will go over our image. 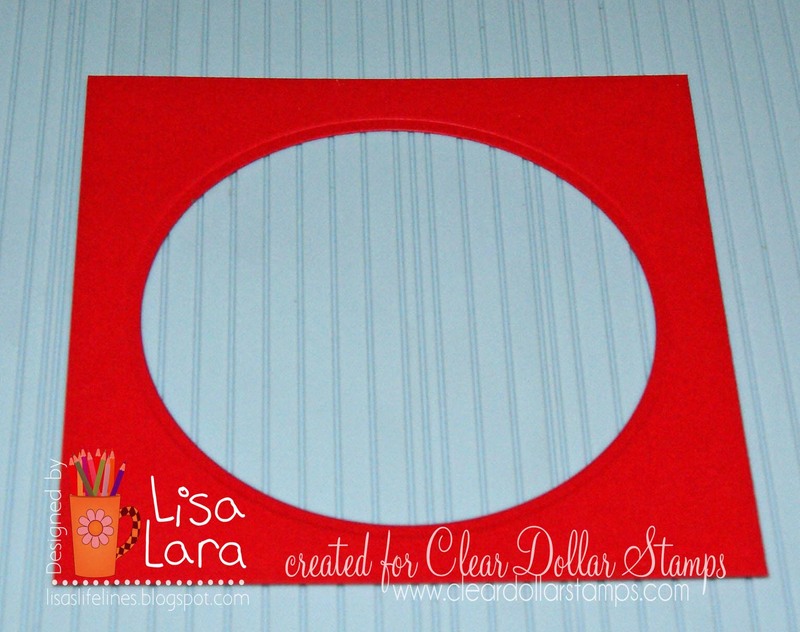 I used the largest Spellbinders Circle Nestabilities die from the large circles set. I embossed the circle edge as well. This is how they will overlap each other. 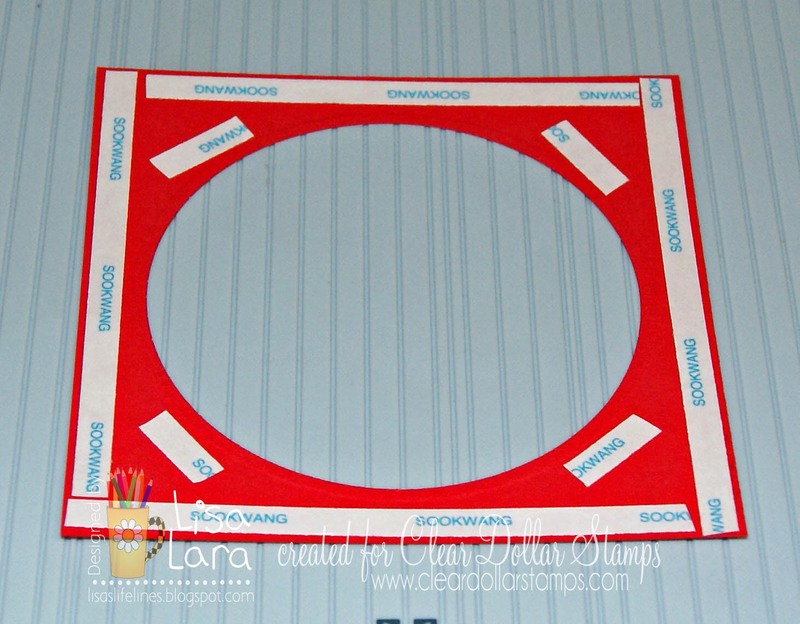 Place score tape on the back of your red panel to adhere our acetate (clear cardstock). 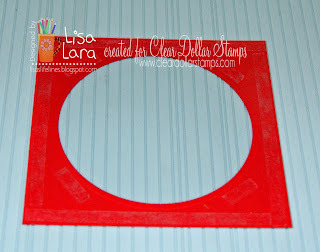 Now adhere your 4 3/4 x 4 3/4 acetate piece to the back of your red front panel. 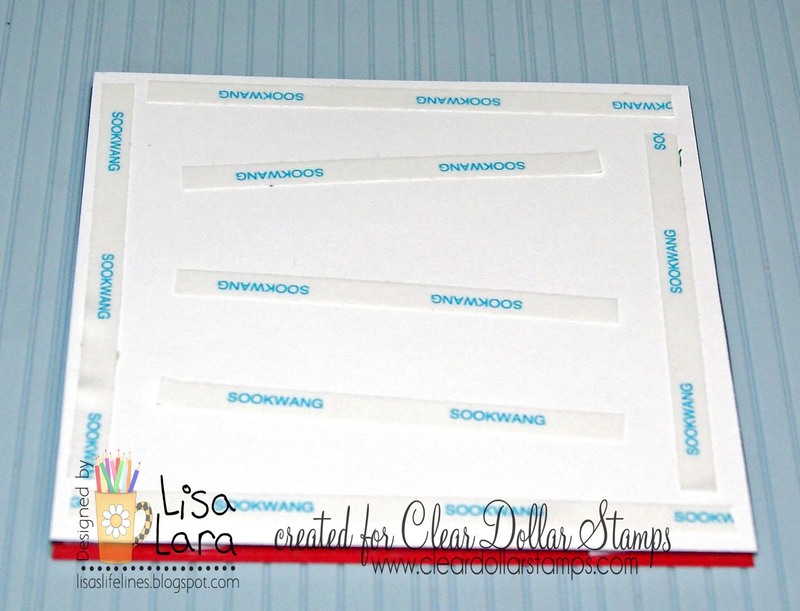 Place 1/8" thick diemsional tape on the back with no gaps along the edge of the die cut out so your fill does not fall out. 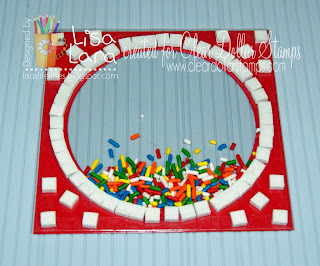 Then put 1 teaspoon of candy sprinkles on top of acetate in circle. Then adhere second 4 3/4 x 4 3/4 piece of acetate. 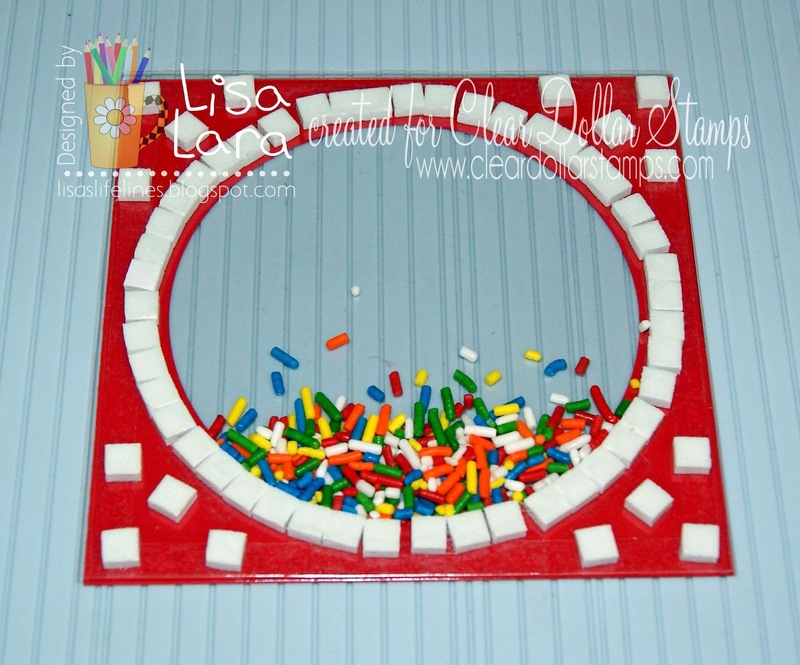 I did this to contain the sprinkles and so there is a barrier between them and my image since it is candy. 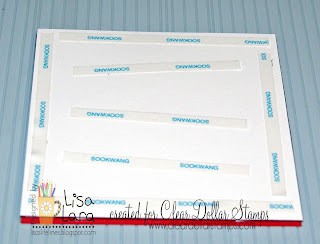 After adhering acetate, adhere your image panel then cover with score tape to adhere to card front. Now you are ready to adhere to your card front. Here is what it looks like adhered to the card front. You're done. Wasn't that simple. So fun with the sprinkles! 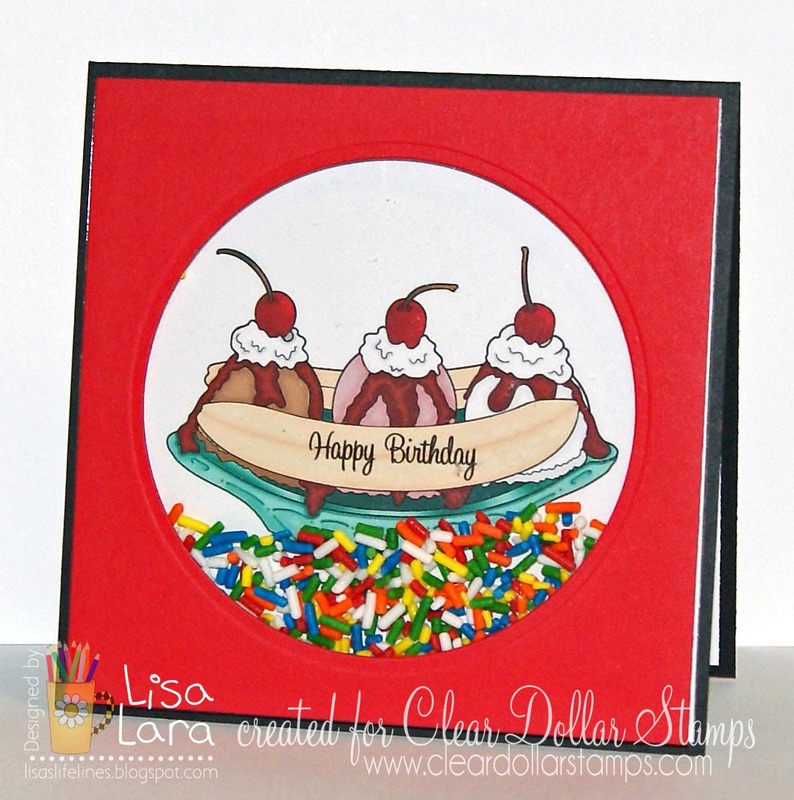 Love your cards today Lisa. This is an amazing tutorial you put together here today. I have never created a shaker card and now that you have inspired me, I am gonna give this a try real soon. Thanks so much. As I went through your tutorial, I thought, "Wow, that ice cream idea is cute!" But THEN, I saw the snow one and gasped--it is my favorite!!! GREAT tutorial! 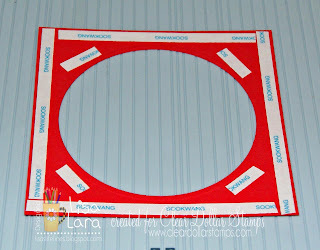 Love your cards...This is an amazing tutorial you put together here..i might try it with Gift Card envelopes.